Is the following the Covenant that the Antichrist will “CONFIRM” as stated in Daniel 9:27? 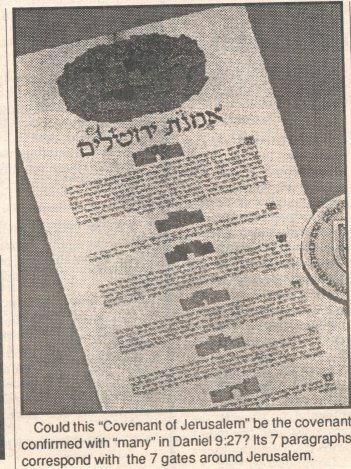 It is claimed that this was circulated among jewish organizations in 1992. Obviously, no one else would sign it because it denotes Jerusalem as the capital of Israel. Will the Antichrist someday sign it and confirm it? The following is a copy of a portion of the original document. The following is the entire text of the document. Click on the following site that is circulating petitions for the sovereignty of Jerusalem. Read the following commentary by Eddie Chumney about why the world may accept this covenant because of the Antichrist and the international flavor to it. Many believers are not familiar with the Jerusalem Covenant. It was signed by Israel’s leading religious and political leaders on May 19, 1993. Will the False Messiah also sign this covenant with Jerusalem? These are the days when the final status talks regarding Jerusalem are taking place with Israel and the PLO. Only time will tell. The text of the Jerusalem Covenant can be found here! Why might the False Messiah be willing to sign the Jerusalem Covenant? Because it is worded is such a way to promote the internationalization of Jerusalem and make it a city for “all faiths”. Let me highlight a part of the Jerusalem covenant for you. but this next verse in Isaiah 2:3 does NOT say (*** Each and every nation will live will live in it by its own faith***) but is says that the TORAH will go forth from Jerusalem. 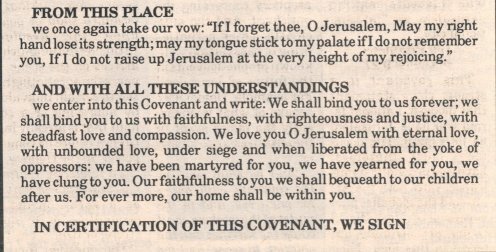 The Jerusalem covenant is written with phrases to be tolerant of all religions. During the days of Isaiah 2:2-4, it is the TORAH which will go forth from Jerusalem (Isaiah 2:3) and the Messiah will rule them “with a rod of iron” (Revelation 19:15) and HE will JUDGE among the nations (according to the Torah) (Isaiah 2:4). They have “added” the “universality of Jerusalem being a religion of all faiths” to the Jerusalem covenant. With the covenant of Jerusalem having this “universality” phrase to it, it fits the agenda of the United Nations plan and goal for Jerusalem in conjuction with the New World Order to have it be an international city of “all faiths”. This phrase in the Jerusalem covenant discussed above is consistent with the goal of the Israel/PLO peace process. The Israel/PLO peace is based upon U.N Resolutions 242 and 338. Implied in U.N. Resolution 242 is for Jerusalem to be divided according to the original U.N. plan for the state of Israel in 1947 and become an international city. So, the false Messiah may be willing to sign the Jerusalem covenant. Email me, if you have questions or want to know more, because I love to talk about my God! My God likens me to His future bride and like any pending bride I love to talk about my betrothed and about our future wedding day when He will truly, totally take care of me in the way that is best for me!!! This entry was posted on June 14, 2009 at 7:09 pm and is filed under Uncategorized. You can follow any responses to this entry through the RSS 2.0 feed. You can leave a response, or trackback from your own site.